A while ago, the editor of a big publishing house reached to me with the idea of penning my journey in a book. HYDERABAD: When did the idea of writing the book strike? Was it also dramatic, like the rooftop moments you have experienced that prompted you to move to Singapore or quit your job? Or was the idea to write a book a natural extension to what you are doing? A while ago, the editor of a big publishing house reached to me with the idea of penning my journey in a book. I saw a fleeting glimpse of a book penned by me in a hallucinogenic shamanic ritual in Ecuador. My blog readers and social media followers have often reached out to me, encouraging me to write a book. And I’ve tried for years, but always given up. I think the real call from within came close to my 29th birthday. 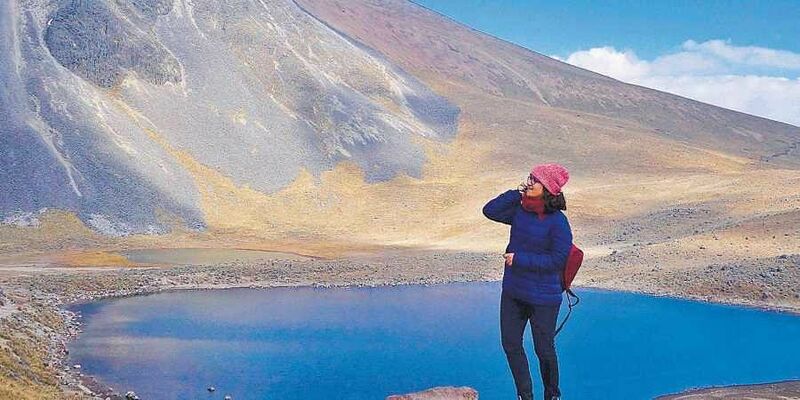 I felt like what I wanted to pen is the story of my twenties – my battles, triumphs and (mis)adventures on my journey from the cubicle to the road and from small-town India to remote corners of the world. 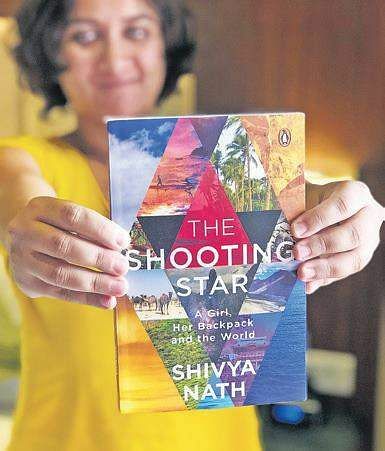 I started writing the first draft of ‘The Shooting Star’ on a rooftop in a small Himalayan town, with the Dhauladhar mountains stretched out before me! Your writing is pretty honest, even confessing about your own thoughts on spending a night with a stranger on the rooftop of the clock tower in Rann of Kutch. Is straight-from-the-heart writing a deliberate attempt? I’ve tried to write candidly about my personal battles, dilemmas and social issues – things that we are often afraid to voice, especially as Indian women. At the same time, I hope this book will inspire more people to find the courage to question archaic conventions, walk away from societal expectations and follow their own passion, whatever that might be. Do you agree that there could have been at least a slight dramatization of events to make it sound like a thriller or were the events mentioned really as dramatic? Each day on the road can’t be filled with drama, of course. But the experiences, encounters and episodes I’ve written about in the book are chosen from nearly seven years of travelling – five of those without a home or permanent address. And I’ve chosen them because they were life-changing in many ways – and certainly as dramatic as they’ve been penned! If a modern youth were to leave everything today and start a life like yours – if not as a blogger but perhaps finding a temporary job locally, what do you think he/she should start with, besides hope and confidence? Conviction and open-mindedness. Conviction, because a lot of people (including your own family and friends) will tell you that what you’re about to attempt is impossible. But if you feel like this is your calling, believe in yourself and surround yourself with people who inspire you – find them online if you can’t in person. Open-mindedness, because your journey might evolve in ways you can’t imagine; be open to letting the journey mould you as much as you mould it. Financially, I also highly recommend having savings to fall back upon. If things take longer to work out than you’ve anticipated, at least you’ll have the confidence to keep going a little longer, to re-evaluate your passion and skills and figure a way forward. Have you ever been to Hyderabad and if yes, what do you think this city needs. What do you think my city needs to be a global city? I’ve only ever been to Hyderabad years ago, for a friend’s wedding. In general though, I feel that most Indian cities need a closer connection to nature. I recently travelled to Copenhagen and was amazed to see more bicycles than cars on the road, and to hear that no resident in the city is more than an eight-minute walk away from a green space! Imagine if Indian cities could be greener, with lots of public parks to walk and hang out, cycling lanes, cars with better pollution measures so it’s actually possible to cycle… I’m sure we’d be healthier and happier. Do you regret that Ecuador episode where you ended up with a hangover or was it one of the most life-defining moments for you? While I was at it, in that ominous rainforest, unsure of whether I would ever regain control of my senses, I kept cursing myself for landing up there. But in retrospect, it put so much in perspective for me. I came out with so much gratitude for my life and family – something I’d seldom felt before. And hey, I saw a glimpse of the book I’d write someday… and look what happened! How do you manage if you were to get an online delivery? What would your address be? I usually don’t end up buying much on Amazon - given that I can only carry what fits into my bags, I have to resists the temptation to order anything that’s not absolutely necessary. But when I do have to get a delivery, or a courier (contracts etc), I wait until I’m slowing down somewhere. Worst case, I send it to my parent’s house in Dehradun and wait to visit them before I can retrieve it. I make it work! Do you manage to cook. Does that mean you buy stuff locally and dispose it when you move to another place to keep it light? Or do you have a cooking kit you carry? I mostly stay in Airbnbs and homestays, and many of them come equipped with basic kitchen facilities. I only cook basic stuff, so only have to go a market to pick up ingredients. Since I turned vegan, I also love to have smoothies wherever I am - so I acquired a handy little blender which charges with a USB; this is the only kitchen gadget I carry with me! “I don’t know how I landed up there. My head was spinning uncontrollably. My body felt like it was on a roller coaster that was constantly changing direction. It took enormous effort to prop my head in my hands, but I had to, for I had the feeling that it was detaching itself from my body, slipping away like a ball rolling down a slope. What was once the soothing hum of the Tena River, cascading down just steps from our makeshift shed, had turned into a deafening roar that grated against my ears; I wanted desperately to shut it out.